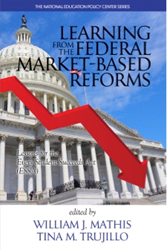 With chapters written by a who’s who of the educational research world—a collection of authors that Larry Cuban describes as “a cast of all-star scholars” and Gloria Ladson-Billings calls “some of the nation’s best minds”—the National Education Policy Center released its latest book: “Learning from the Federal Market-Based Reforms: Lessons for ESSA.” Editors William Mathis and Tina Trujillo brought these researchers together to create a critique of recent reforms followed by a series of proven, research-based reform strategies. 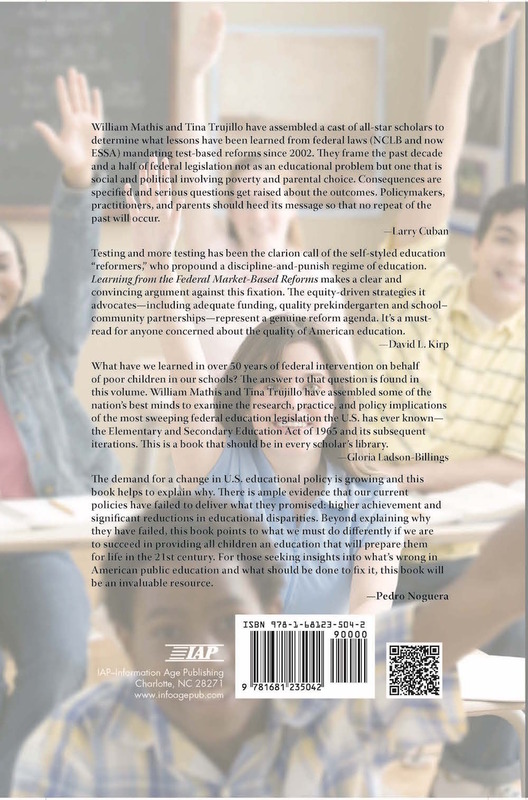 Throughout the book, scholars such as David Berliner, Gary Orfield, Mike Rose, Janelle Scott, Richard Rothstein, and Angela Valenzuela remind readers that reform requires society to address the root causes of inequities within schools and beyond the school walls, closing opportunity gaps wherever they arise. The community must address deprivation, poverty, racism and the inadequate and unequal distribution of resources. EARLY ORDER SAVINGS – Purchase the book on the IAP website at a substantially reduced price of $30 per paperback or $70 per hardcover plus s/h. The code to use at checkout is LFMBR30350.